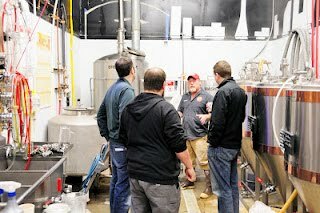 Back in the fall of 2011, the Washington Homebrewers Association (WAHA) sent out an email to all of the Washington AHA registered homebrew clubs to see if there was any interest in working on their own commercial collaboration brew for NHC. One of our first choices, and a favorite brew pub among many of our club members, Naked City seemed like the ideal candidate for such a collaboration project. Although we would have been more than happy to brew anything with Don, the brewer and owner of Naked City, we decided that as a club, we should come up with a few ideas to present to him beforehand. One club member had recently picked up a 30 gallon whiskey barrel from the Woodinville Whiskey Company which was recently drained of their Harvest Release American Whiskey. We had been planning on using it for a club project, but with the advent of a collaboration brew and a little time on our side, we thought it would be fun to brew a larger batch of beer on Naked City’s system and then age a portion of it in our whiskey barrel. We could then compare barrel-aged with the straight up beer or even create a blend if it was beneficial. With the decision made to use the whiskey barrel for the Naked City project, our club next debated about what to fill it with. A multitude of ideas were tossed about, but in the end, Don and the other members of our club decided with the always-popular-among-beer-nerds Russian Imperial Stout. Don left drafting the recipe completely up to us and so in designing the grist and recipe, we went with a combination of grains that leaned towards a chewy, chocolate base with a mild residual sweetness and just enough clean bittering hops to keep it from being cloying. All in all it was a great brewday at Naked City. Don is an excellent host and fantastic brewer, many thanks to him and his support of the homebrewing community. For an Opacity inspired homebrew project, check out Mrs. Voorhees Barrel Aged Imperial Stout.